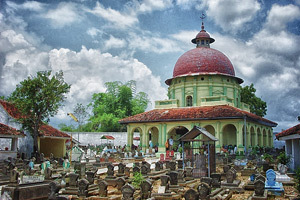 Asta Tinggi is a Royal Cemetery located in Kebunagung village on the northwest side of Sumenep city, about two and half kilometers away. Asta Tinggi has two main buildings. The first is on the west side where one can find an old pendopo and three grave dooms. It is a simple pendopo used for holding a meeting in the time ago. While the dooms is placed for grave. The first doom located on the west and content of Prince Pulang Jiwo grave. The second doom located on the north, is a grave of Prince Jimat and the last that listed on the east content the grave of Bindoro Saod and the queen Raden Ayu Tirtonegoro. This old building was built in 1750 in the reign of Bindoro Saod whose titled as Raden Tumenggung Tirtonegoro. The second building placed on the north side is greater. The entrance is a big and beautiful gate. About 2 meters after it, there is an inscription written in Arabic letter. This building has one great and interesting doom content of the grave of Arya Noto Kusumo I and his descendants. It has Islamic, China and Europe style. It was built in the year of 1763 by Aryo Noto Kusumo I.